Bioedukasi journal contains scientific articles in the form of research, the study of literature, ideas, application of theory, critical analysis study, and studies to the Islamization of science education in the field of Biology. 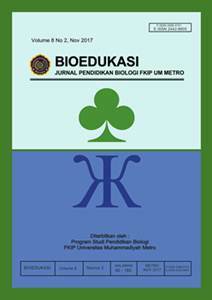 Bioedukasi Journal is published two times a year, the period from January to May and June-November, published by Educational biology FKIP Muhammadiyah University Metro. is indexed by Indonesian Publication Index (IPI), GOOGLE SCHOLAR, Index Copernicus International, SINTA (Science and Technology Index), Bielefeld Academic Search Engine (BASE), Crossref and Directory of Open Access Journals (DOAJ).